I have to admit that the whole not having to clean grinds out of the machine is one of the main reasons we went with a Nespresso machine. My father has one and I’d used it on a visit home to Toronto and while I felt the roast used a heavier hand than was perhaps required, it was amazing in all other ways. I love the way you can pop open the pod and collect the grinds plus you can recycle pod casings. So we bought a Nespresso machine which was not inexpensive. We opted for the one with the separate milk frother rather than the cube with milk as it seemed easier. Our milk frother has not ever worked as well as my dad’s but I guess that’s just down to voltage or something. Anyway, one of the things about Nespresso is that they are constantly releasing new pods and limited editions. We usually love the non-flavoured ones and buy them ourselves. Sometimes, like with Cubania, I’m lucky enough to get invited to a launch. 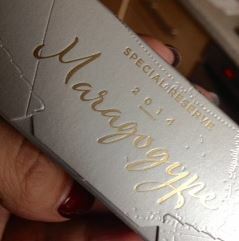 Sometimes, like with Maragogype, I buy them. The design of the pod and box is stunning. A beautiful silver embossed box design, the stunning old map of the world is beautifully executed. The silver pod inside decorated with the bean is a nod to the special nature of the bean. It is a work of stunning beauty and I fell in love with the look. The advertising in store was also beautiful, evocative of tasting a fine wine. The coffee itself had a lighter hand on the roast side. I wasn’t getting the usual heavy roast notes coming through, making it much more delicate and suited for an espresso. As someone who regularly drinks her espresso as a latte, this pod was too complex and subtly for that. You lost some of the really fleeting berry notes and it comes out much more flat with milk and spoils the flavour. But the soft nose and light flavour on the palate makes for a gorgeous espresso shot. Limited edition, it was sold out when I tried to buy it so grab it if you see it.